Banana Maple Breakfast Quinoa - Eat. Drink. Love. Meet my new best friend, quinoa. As someone who is trying to limit their carb and sugar intake, quinoa and I have become close friends. If you have never had quinoa before, it is basically a grain that is similar to rice. However, quinoa is different from rice in that it is a complete protein and is very high in fiber and it releases sugar into the blood more slowly than rice. I’ve been using quinoa as a rice substitute with my dinners, but I recently heard about cooking quinoa for breakfast and I was very intrigued. I decided to give it a shot and I was very happy with the results! The quinoa was sweet and filling just like oatmeal. I loved the mashed banana that I mixed in with it along with some sugar-free maple syrup, and then I topped it off with some fresh blueberries! If you are short on time in the morning, cook the quinoa the night before and just re-heat it in the microwave in the morning! So easy! – Optional: 1 tbs. ground flaxseed meal, blueberries, strawberries, or a sprinkle of cinnamon. 1. In a medium sauce pan, bring milk and water to a boil, add quinoa. Cook for approximately 15 minutes or until liquid is absorbed (add a little more liquid and cook longer if needed). 1. Stir in mashed banana. Add maple syrup (however much you prefer), and top with fresh fruit! I think you’ve just convinced me that I need to get some quinoa. I’ve been wanting to try it for ages! *sigh* I think I’m going to have to journey to a whole foods – our grocery stores, which are wonderful, just don’t carry them! You totally need to get some, Ann! I use quinoa a lot for a dinner side dish. Never for breakfast. I am a big fan of steel cut oats. I think I might just have to switch things up a bit. This looks great! Go for it, Emily! 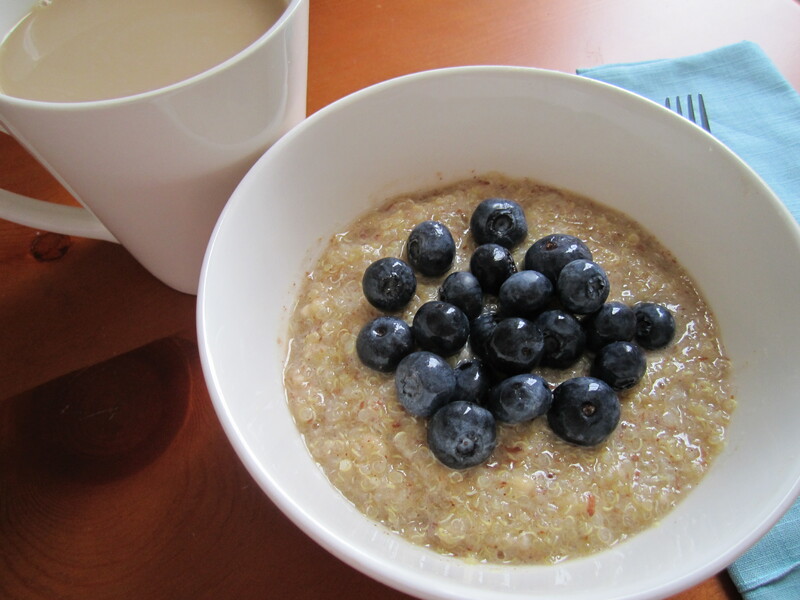 I also love steel cut oats, but this quinoa is a great change! I’m a big quinoa fan, but I’d never thought of making a hot cereal with it. Thanks for the inspiration! I just tried this recipe and I must say it is VERY tasty. It tastes WAY better than oatmeal. I like that there’s a small crunch from the quinoa. I added some cinnamon in the last 5 mins of cooking. Then added a small-medium squirt of syrup, topped with blueberries. The only thing I would do is add some more liquid. Once in the bowl for a few minutes the liquid was gone. I will be recommending this recipe for sure. I’m so glad to hear that, Katie!